The Ariane 5 launch vehicle for Arianespace’s 10th mission of 2018 is now fully assembled following integration of its two satellite passengers at the Spaceport in French Guiana. Ariane 5’s payload fairing containing GSAT-11 is lowered over GEO-KOMPSAT-2A as part of the integration process. During activity in Ariane 5’s Final Assembly Building, the upper payload component – containing GSAT-11, mounted on its SYLDA dispenser system and protected by an ogive-shaped fairing – was lowered into position over GEO-KOMPSAT-2A, which was previously installed atop the launcher’s central core stage. This step clears the way for final checkout, which will enable the launch readiness review to be conducted on November 30, followed by Ariane 5’s rollout to the Spaceport’s ELA-3 launch zone the following Monday, and an early evening liftoff on Tuesday, December 4. The upcoming mission is designated Flight VA246 in Arianespace’s numbering system, and it will inject the two payloads into geostationary transfer orbit. To be deployed first during the 33-minute flight sequence is GSAT-11, which was designed and assembled by the Indian Space Research Organisation (ISRO). Operating from a final orbital position at 74 deg. East, this advanced communications satellite will deliver multi-spot beam coverage over the Indian mainland and nearby islands – bringing significant advantages to the user community when compared with India’s existing INSAT/GSAT satellite systems. 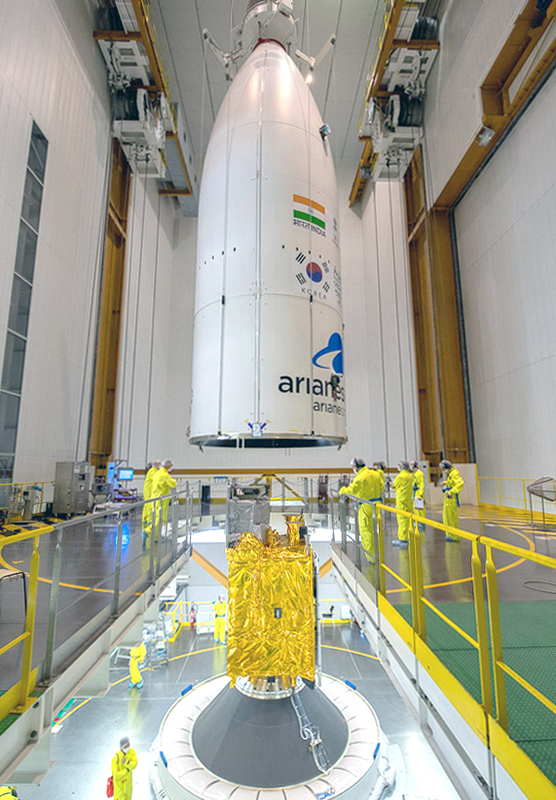 Ariane 5’s second passenger – GEO-KOMPSAT-2A – was produced by the Korea Aerospace Research Institute (KARI). It will be used primarily to provide meteorological observation and space weather monitoring, stationed in orbit at 128.2 deg. East. 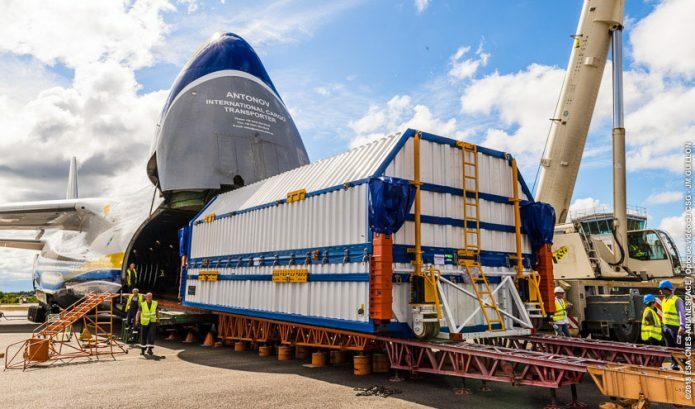 Flight VA246 will mark Arianespace’s 10th mission performed in 2018, and the company’s sixth this year using a heavy-lift Ariane 5 – which is one of three launch vehicles operated by Arianespace at the Spaceport, along with the medium-lift Soyuz and light-lift Vega. A larger version of the photo above is available in the Gallery. on Dec. 4 Between 2:07 a.m.
on Dec. 5 Between 5:37 a.m.
on Dec. 5 Between 9:37 p.m.